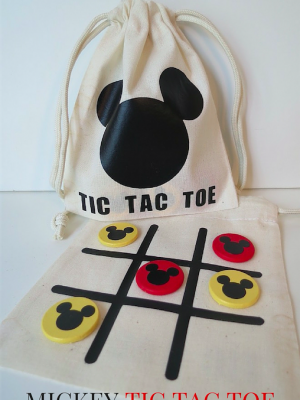 I made this fun game of Mickey Tic Tac Toe for our family (and a couple for gifts). 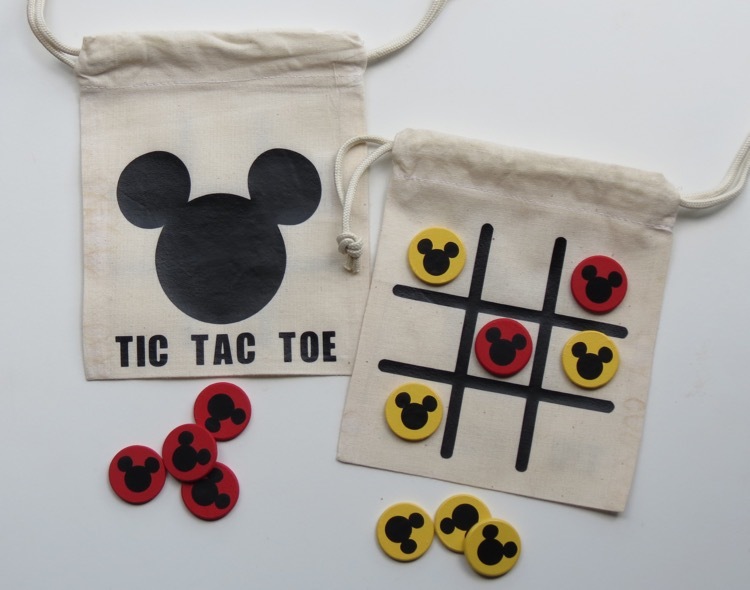 They are great for on-the-go fun because everything stores inside the bag and the playing board is on one of the sides of the bag. I used my Cricut Explore Air for the vinyl and iron-on pieces. 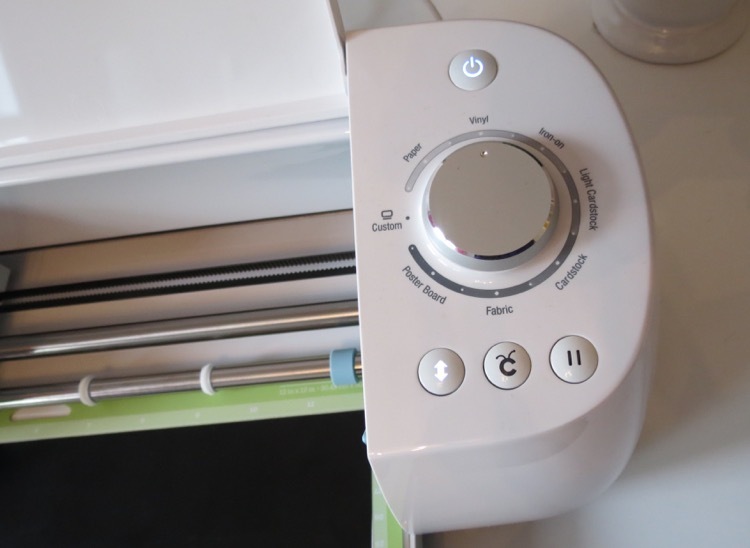 The Cricut Explore Air really is one of my favorite and most used crafting tools. 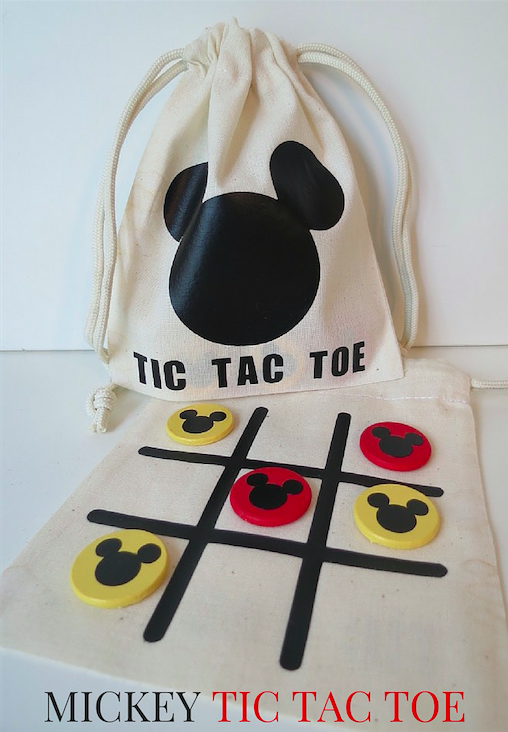 All of the playing pieces for the Tic Tac Toe game store inside the pouch. 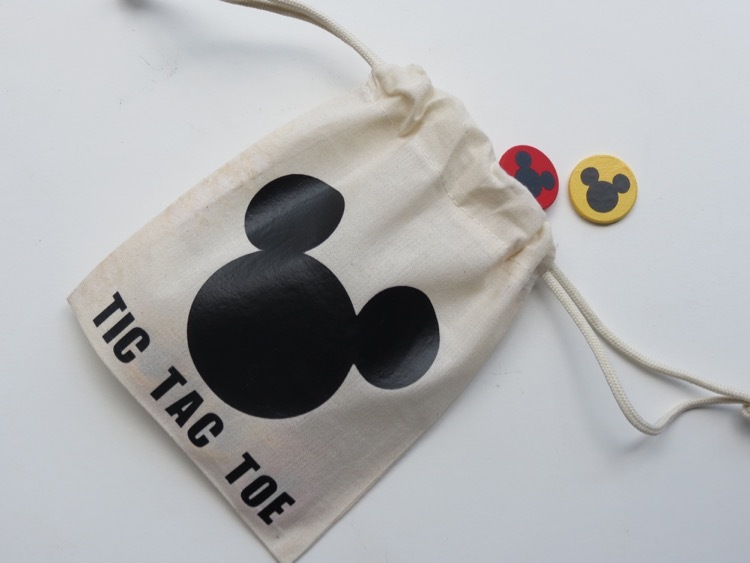 On the reverse side of the pouch is the Tic Tac Toe board game. 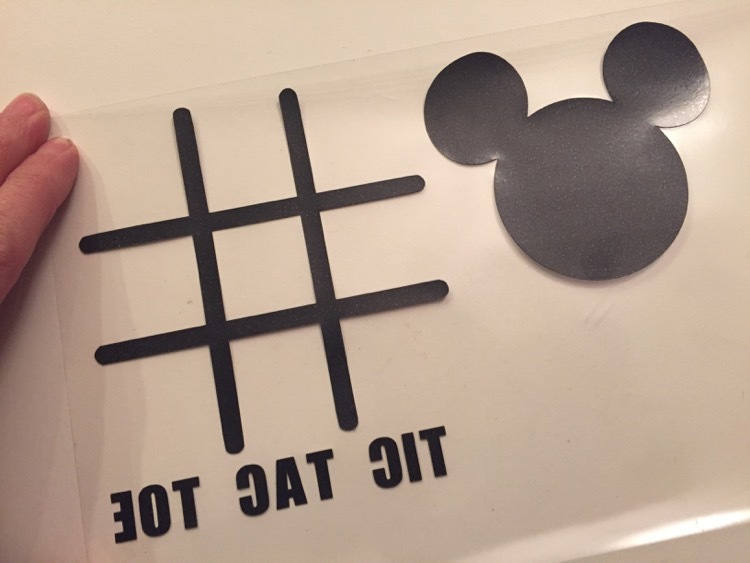 To cut the image of the iron-on material, I bought the Mickey Mouse image from the Cricut store (it was $1.49). I imported my own image for the Tic Tac Toe board and I used a solid font for the words. In order to make sure the iron on turned out correctly I had to mirror the image so it was cut backwards. You always want to remember this step when creating iron ons. Ironing on the image was super easy! I set my iron on the cotton setting and turned off the steam. 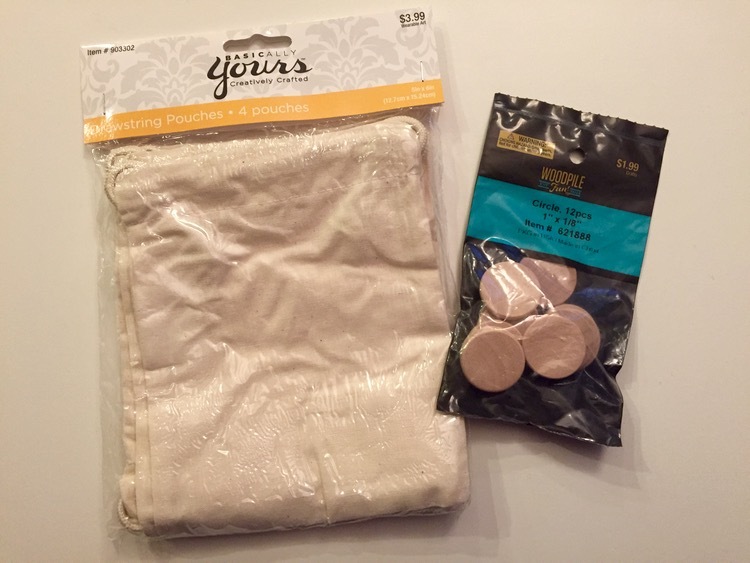 I warmed up the muslin bag first for about 15 seconds then I added the image I wanted to iron on. I laid a light flour sack towel over the image and placed the iron on top for about 20 second intervals. I made sure to lift and press the iron instead of dragging it across the image. It came out perfect! Next up, I painted the discs, I painted 1/2 red and 1/2 yellow. 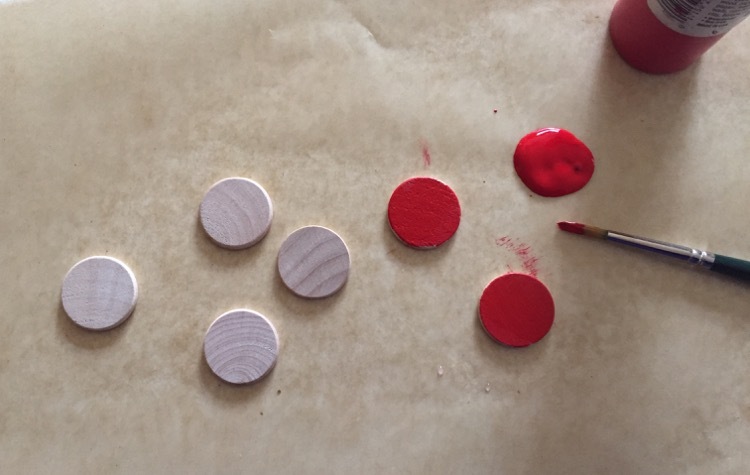 I decided to go with colors to distinguish between the 2 different playing pieces instead of “x” and “o”. I used my Cricut Explore Air to cut out the small Mickey images out of vinyl so I could easily adhere them to the top of each disc. 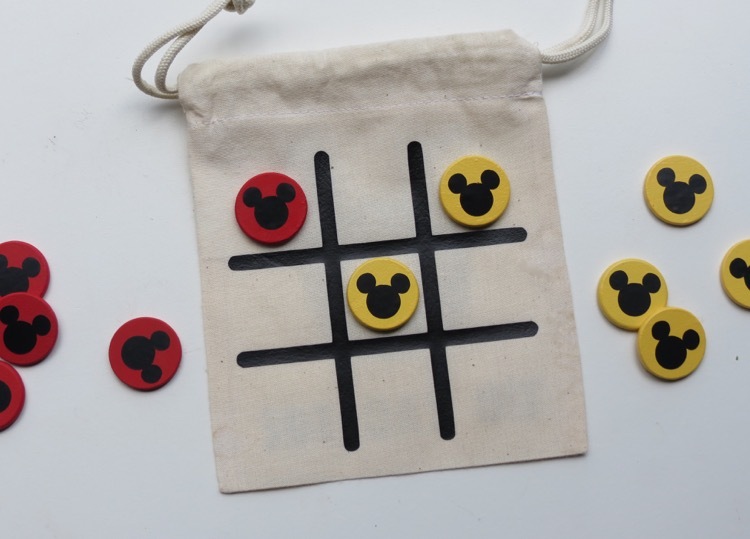 Here are the playing pieces all finished with paint and the Mickey’s attached. I was super pleased with how it turned out and how quick it was to make. The fun thing is with the Cricut Explore Air you can customize this game with any character or image you want. If you have kids that love Disney’s Frozen you could make one with a Frozen them. Your options are endless! I was provided with a Cricut Explore Air. All thoughts and opinions are my own and honest and true. Affiliate links have been used, so if you buy a Cricut or supplies through my links I will earn a small commission. so cute and trying to make this as FE gifts for a cruise. How did you create the lines and what size is the mickey head? i found the same bags a hobby lobby. To make the tic tac toe easy on myself I just googled “tic tac toe svg”. I chose one, saved it and then uploaded it to the cricut design space. The Mickey head is about 2 1/2 inches wide and tall. Have fun! Made these – so cute! Thank you! To think, I was cofuesnd a minute ago.